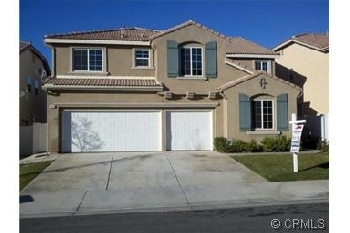 Description - 26896 Nucia Dr , Moreno Valley 92555 2006 Gorgeous beautiful mountain view house. Total 3775 square feet and lot 5500 square feet. 6 bedroom and 3 full baths. Also, a huge loft in 2nd floor. One bedroom & full bath in downstairs plus a big bedroom/office. Granite counter top in Kitchen. A big family room. Many extra space for a big family. 3 oversize car garages. Nice landscaping in front & back yard. Close to hospital, shopping area, schools & RCC campus. Great school area: Val Verde Valley School District. Living Space: 3775 Square feet/ Lot: 5500sf Application fee $30, Rent $2400, Security Deposit $2400, Pet Deposit $300 Please Call Best One Management 951-208-0441Please visit website: www.BestOneManagement .com for more properties info. Copyright © 2010 bestonemanagement.com. All rights reserved.